This book of about 220 pages is considered to be one of the initiators of the sharing econommy litterature. Written and pubblished for the first time in 2009, many situations described in its pages have now substantially evolved, involving new players and disrupting/innovating "old markets". What I found curious about this book, is that many of its forecasts already turned to be correct. In fact, in 2015, the sharing economy is gaining overall trust as a collective brand, and people are trusting strangers now more than ever. Even though the book does not really follow an accademic approach, some statistics are presented when most needed, giving more sense to the deep and why not also "philosophic" discussion of the authors who try to convince the world that collaborative consumption is our future. The book focus on the raising importance of access-based economy, and it does so by arguing that actually, most of the times, we don't need something but we just need what that something does. As for this, also big multinationals such as XEROX, IBM and Steelcase started to follow this pattern, offering to their customers not a product per-se but its functionality. It appears clear that this approach constitutes a valid and relevant incentive for the producers to avoid built-in obsolesence, delaying as much as possible the disposal of the product and therefore prolonging its usage life. Personally, I loved the chapter Four Principles of Collaborative Consumption. This framework includes four main points: Critical Mass, Idling Capacity, Belief in the Commons, Trust between Strangers. If you want to understand the functioning of collaborative consumption, this basic vocabulary should be known to you at least as good as your pockets. These principles helped me structuring my entire knowledge on the sharing economy, making some order in my brain. "Not only do the things we own fill up our closets and our lives, but they also fill our minds". 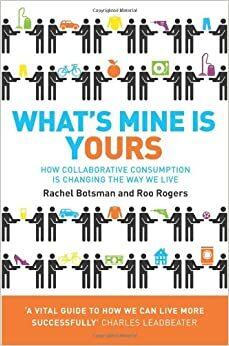 "Every single person who joins or uses Collaborative Consumption creates value for another person, even if this was not the intention." "The residents of Topanga had so many ideas that they had to decide where to start. The challange the residents experienced was coordination." Rachel Botsman is also founder of the platform www.collaborativeconsumption.com, which is something like a wired magazine for the sharing economy, just with more functions for the users. Take a look to the website for new updates on collaborative consumption. Thank you for reading my reviews, I would appreciate if you could comment and share my post, keep checking my blog for reviews or visit my .